One In A Million: Images & Words 74~ Take A Hike. Images & Words 74~ Take A Hike. Photo below taken on my hike to the Falls. Hi Milli! I love your picture.... I love the green of nature. I made a personal entry as well, and used the same quote, lol. Beautiful picture - wonderful words. thanks for ur comment on mine! That quote is so perfectly true .... gorgeous place to hike .... can well imagine what you must have taken away with you from there .... love the way nature never lets us down. 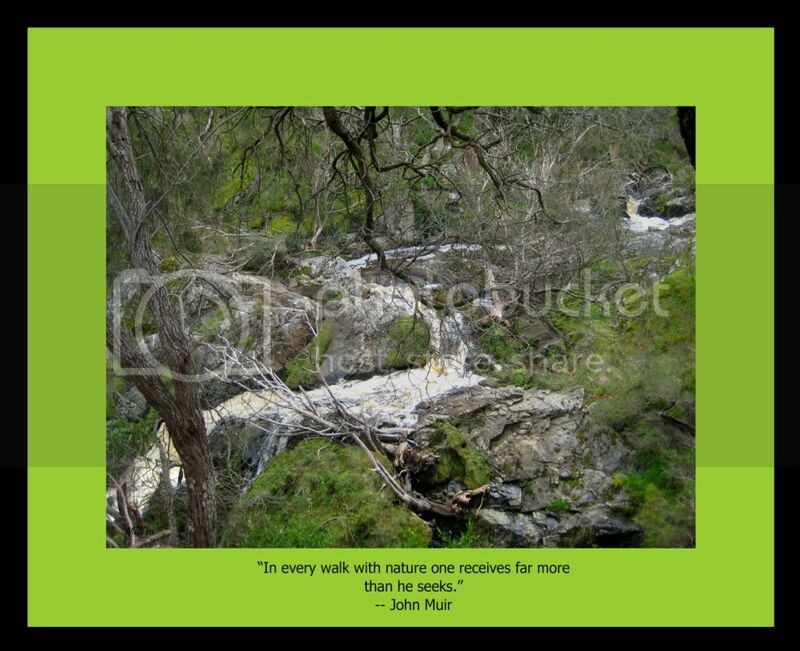 Oh my I so love that quote, love John Muir.. and the photograph stands alone, apart... Exceptional!!! Great Entry Milli. Hugssssss. How absolutely beautiful - and true! The Lord has so many special places waiting to draw our breaths away, places just like this one. So true this quote....confirmed by this beautiful photo! Images & Words #74 " Take a Hike "
Wow, what a gorgeous photo and wonderful quote, great job. just lovely! would have been a sight to see in person! Gorgeous!! The words are so true and I love the way you framed the creek. Your shots are always a treat! True words with a fabulous place for hiking Milli. Love the pic and quote...nature is very giving, eh? Too bad we humans do not always treat her so kindly. Your quote just sums it right up. I love this photo...makes me miss those walks in the back places. You got that quote right mate. I am practicing my accent. Lol! This is such a neat picture. Love the greenery and the rock. Hello Milli. As usual...u've taken a really fantastic shot. This is absolutely gorgeous.Nothing like a hike back in the woods to a set of waterfalls. Probably a broken bone in this location. Very wild location is this and one where Digital has to be over-ridden. very beautiful! I would love to sit and listen to that for a while! Waterfalls are so refreshing Milli, the air feels so clean around them. Neat shot and perfect words. Water is always on the move! I love those words, sooo true! Images & Words # 74 ~ Take a Hike! What a great hike. Nice landscape too.